Fairtrade is an issue close to our heart and one we aim to support by providing our clients with the option to order Fairtrade products when possible. All of these can be easily identified in our product catalogue by the Fairtrade mark, or can be searched for on our online system by selecting the Fairtrade filter. Fairtrade is all about better prices, decent working conditions and fair terms of trade for farmers and workers. There are many opportunities for businesses to get involved and we offer a range of Fairtrade products that can be used as a focus during the Fortnight, or for your own Fairtrade breakfast event. Breakfast items could include Fairtrade tea, coffee, sugar, biscuits or confectionery We also provide Fairtrade cotton bags, clothing and other items. 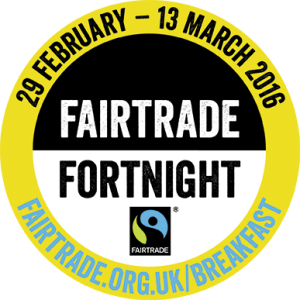 BE PART OF FAIRTRADE FORTNIGHT 2016 – Everything your business needs to know about Fairtrade Fortnight 2016. Millions of farmers and workers in developing countries work hard every day to grow the food we eat. Yet may don’t earn enough to know where their next meal is coming from. By offering Fairtrade products your business can be part of the solution to food insecurity. Take the opportunity this Fairtrade Fortnight to help your customers understand what your commitment to Fairtrade means. Sit down for breakfast. Stand up for farmers. For the 2016 campaign we are asking the British public to support the farmers and workers behind our food to feel secure, knowing they can feed the people they care about. Specifically, we’ll be inspiring people to make their breakfast count with Fairtrade – using the power of their shopping to choose a fairer deal for farmers and workers. Research shows that some smallholder farmers who are part of Fairtrade earn about a third more than they did before, which means they can now afford more of the important things, like food, medical bills or sending their children to school. Being part of Fairtrade means farmers get a fairer price for their products, and a little extra to invest in developing their farms. For many, this means they can grow food for themselves, as well as crops to sell. Workers on large plantations use the money they earn from Fairtrade to subsidise the cost of everyday foods, like maize, when times are hard. We will use this campaign to raise awareness of Fairtrade and the issues of food security and increase understanding how Fairtrade helps overcome the issues. The campaign is rooted in consumer insight and learnings from Leapfrog and Globescan (2015) which shows that people need to be made aware of the problems facing farmers and workers before they can fully understand how Fairtrade works as a solution to these. Head over to our Resources Library where you’ll find inspiration and information to help you tell your Fairtrade story – from Campaign Lock Ups and our Marketing Materials Guide to Out of Home POS Artwork files and Product Illustrations.